LONDON — British detectives investigating the poisoning of two people with a military grade nerve agent said Friday that a small bottle found in the home of one of the victims tested positive for Novichok, a lethal substance produced in the Soviet Union during the Cold War. 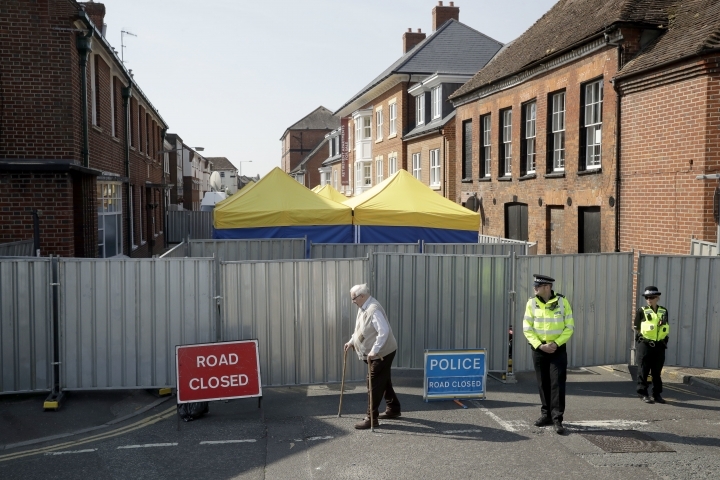 Dawn Sturgess, 44, and Charlie Rowley, 45, were sickened on June 30 in a southwestern England town not far from Salisbury, where British authorities say a Russian ex-spy and his daughter were poisoned with Novichok in March. Sturgess died in a hospital on Sunday. Rowley was in critical condition for more than a week, but has regained consciousness. The Metropolitan Police said the bottle was found during searches of Rowley's house Wednesday and scientists confirmed the substance in the bottle was Novichok. Police have interviewed Rowley since he became conscious. Police are still looking into where the bottle came from and how it got into Rowley's house. They said further tests would be done to try to establish if the nerve agent was from the same batch that was used to poison Russian ex-spy Sergei Skripal and his daughter, Yulia. More than 100 police officers had been searching for the source of Rowley and Sturgess' exposure in the town of Amesbury, where they lived, and Salisbury, where the Skripals were poisoned. The Skripals survived and were released from the Salisbury hospital before Rowley and Sturgess were poisoned and taken there. British authorities took the father and daughter to a secret protected location. British police said earlier they suspected the new victims had handled a container contaminated with Novichok and had no reason to think Rowley and Sturgess were targeted deliberately. Assistant Police Commissioner Neil Basu, Britain's top counterterrorism officer, told local residents this week that Novichok could remain active for 50 years if it kept in a sealed container. He said he could not guarantee there were no more traces of the lethal poison in the area. Basu said Friday that cordons would remain in place in some locations to protect the public despite the apparent breakthrough in the case. He would not provide more information about the bottle found in Rowley's home. "This is clearly a significant and positive development. However, we cannot guarantee that there isn't any more of the substance left," Basu said. The continued blocking off of areas would "allow thorough searches to continue as a precautionary measure for public safety and to assist the investigation team." The Novichok saga began in March when the Skripals mysteriously fell ill on a park bench in Salisbury. They were found to have been poisoned with Novichok. Prime Minister Theresa May blamed the Russian government for the attack, which the Kremlin has vehemently denied. The case led the United States and other countries to expel a large number of Russian diplomats. Public health officials said the risk of exposure to the public is low, but advised people not to pick up any strange items.